The back is an important part of our body. Thanks to the back we can stand, carry stuff and move. However, back pain is one of the most common pain in the body that causes multiple inconveniences to our daily life and work. Among various treatments to back pain, heating pad is the most convenient treatment that we can do at home at a cheap cost. This article will provide you will some tips to choose the best heating pad for back pain. 1.2 What is heating pad? Back is a complicated structure in human body. It consists of bones, muscles, nerves and joints. Each of these can be a cause of back pain. The majority of back pain cause is not severe damage or diseases. Minor sprains, strains, or a pinched or irritated nerve are. They can be the results of everyday activities, either at home or at work; or as a gradual development. In many cases, heat and cold therapy are recommended for back pain treatment. Among all the forms of those therapies, heating pad is the one that is cheap and easy to apply (even at home) and safe (pregnant woman can use). A heating pad is a pad that warm parts of the body to ease pain. Heating pad is a localized heating tool that dilate blood vessels, enhance perfusion to the targeted tissue. Heating pad is effective in alleviate pain and for arthritis. A heating pad can be an electrical, chemical pad or a hot water bottle. This is oldest and simplest form of a heating pad. It can be created at home by filling a container with hot water and applying it to the pain area. Nowadays, people do not use hot water bottle as a heating pad as much as before because water can’t stay hot for a long time and it’s hard to apply on the back. An electrical heating pad generates heat by the process of electric current flowing through a heating element. This is the most convenient form of heating pad. Electrical heating pads can heat up the pad in a really short time. However, this is also the reason for the overheating problem. So, the best advice for using an electrical pad is to follow the instruction. Heat of a chemical heating pad comes from a chemical reaction and a heat reservoir. It is reusable by boiling the pad in 10 to 15 minutes. This is also the drawback of chemical heating pad. A heating pad with deep and penetrating pad can relieve pains and boost recovery process. The heat stimulates the sensory receptors which transmit pain signal to the brain. This results in blocking pain signals transmission. Heat will increase tissue elasticity to ease and relax muscle tension. Heating pad will dilate blood vessels in the targeted area that increase blood flow with nutrients to the pain area. With all those mechanism, heating pad helps ease the pain and speed up the recovery of back pain patient. To gain the best result in back pain treatment, it is important to choose the best heating pad that best suit your condition. This article will focus on the most convenient form of heating pad – electrical heating pad. In order to choose the best heating pad for back pain, you will have to consider the types of heat, temperature settings, size, your use purpose, materials, and the price. Heating pad generate dry heat by default. For many people, dry heat will irritate and dehydrate their skin. 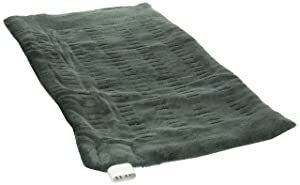 Therefore, manufacturers have added moist heat feature to heating pad. In can generate moisture from air or provided water. You should consider if you want a dry heat, moist heat or combined heating pad. Different pain conditions require different heat level and time. Some heating pads provide you multiple temperature settings (3, 4, 5, 6 or even more). Some heating pads, on the other hands, have only 1 temperature setting or temperature can be changed be holding down the controller. In this case, you won’t know the exact temperature the heating pad is generating. Materials of the pad is important since it affects the feeling on your skin and how to clean the pad. Some materials are not skin-friendly. But this can be solved by using a cover pad. Materials also decide the way you can clean your heating pad: hand-wash, machine-wash, or not washable. Size of a heating pad depends on the size of the body and where do you want to use it. A large heating pad is usually more useful. A large size pad can apply on both a small and big body, lower back and other parts of the body. If you use a small pad, you will have to move it from area to area or buy more than 1 heating pads. In the next section, I will suggest 5 best heating pads for back pain. They are all electrical heating pad with both dry heat and moist heat. Back pain – its large size allows it to cover a large area I your back, warm up the muscles and ease the pain. Neck or Shoulder pain – it can easily wrap around your neck and down your shoulders. Joints – the heating pad is soft so you can wrap it around your joints like knees or arms. Cold and achy – with 6 heat level settings, you can get the perfect temperature for some extra warmth in a cold or winter. Menstrual cramps – for women with menstrual cramps or pain, use this heating pad as a pain relief. Soft micro-plush cover that is harder to clean than plastic cover heating pad. However, it is machine washable. Choose the heat setting you prefer from level 1 to level 6 by the up-down button. Place the pad in the body part you want to ease pain: back, shoulder, knees, neck, etc. Choose the option to auto-off after 2 hours or to stay on. This Sunbeam XpressHeating Heating Pad, Extra Large is No. 1 in my list because it has various great features with a good price. It is also a matter of personal choice since I have known Sunbeam and their heat therapy product for like forever. What I like the most are the 6 heat settings, machine washable material, and Stay-on option. With temperature from warm to hot, I can use it for many different purposes. The soft and machine washable cover is so enjoyable to touch. The 9 ft long cord makes it easy to use the pad everywhere. For people who prefer removable cover and air moisture heating pad, you may want to look for another option. With a soft cover, PureRelief XL – King Size Heating Pad can treat sore muscles in your back, shoulders, abdomen, legs, and arms. You can you for full body relief. With almost the same features as of Sunbeam XpressHeat Heating pad in No. 1 and an addition of a convenient storage bag and $5 cheaper price, PureRelief XL – King Size Heating Pad is a really good deal for people with body pain problems. The pad is not only for back pain but multiple other muscles pain position. If you prefer removable cover, check out some products below. 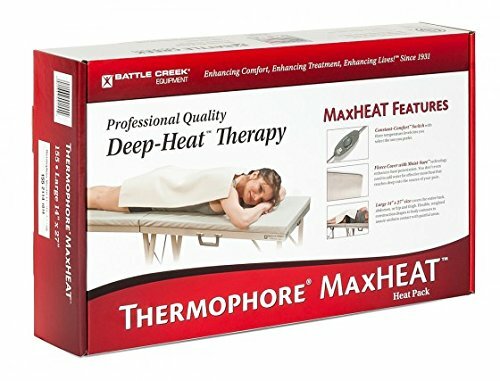 Thermophore MaxHeat Deep-Heat Therapy, Large heating pad can ease and help treatment of Back pain, Arthritis pain, TMJ, Rheumatic pain, Inflammation of joints, Relax muscle spasms. Thermophore MaxHeat Deep-Heat Therapy heating pad is a good choice for people who prefer moist heat to dry heat. The pad will automatically dry moisture from the air so you don’t need to apply water on it. it also comes with a removable cover which is easier for cleaning. The large size allows the pad to cover many part of the body, even hips, thighs, and the whole back. Also, the max temperature of the pad is higher than the first 2 pads we have read, which will be perfect for people who like it to a little hotter. However, if you want to have dry heat alongside moist heat, you should take a look at the product No. 1, No. 2, and No. 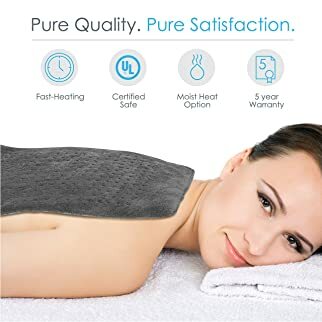 4 in this best heating pad for back pain review. Also, if you prefer continuous heating and a soft cover, this Thermophore pad is nowhere near there. It weighs 2 pounds, 2 times heavier than 2 first products. Moreover, it is about 1.5 times more expensive than other brands’ products in this review. Integrated microplush cover that is not convenient for cleaning. But it is machine washable so this is not really a problem. Choose the heat setting you prefer from level 1 to level 4 by the up-down button. Place the pad in the body part you want to ease pain: back, shoulder, knees, neck, etc. The hourglass shape makes the pad possible to fit in the body’s curves. Disconnect the cover and the cord when washing. If you find normal rectangle-shaped heating pad difficult to fit in some body parts, this hourglass-shaped heating pad by Sunbeam would solve that. The shape allows it to target heat to specific body hence enhancing the treatment. 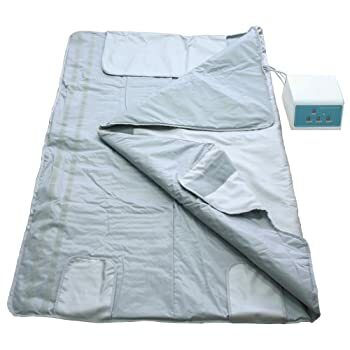 It also has the same great features as the Sunbeam XpressHeating XL heating pad like fast heating up, auto-off, moist heat, soft and machine washable cover. But there for its ranking 4th. First, the pad is a little bit small for me. Although the shape can make up a bit but the pad can’t really cover a large body area as the other products in this review. Besides, its integrated cover and no automatic moisture draw are also its cons. In addition, the price is quite expensive. 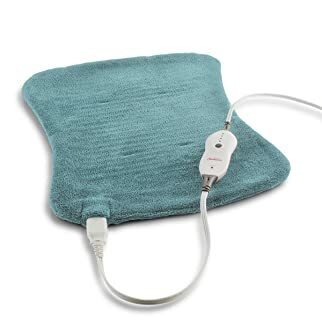 This large and quickly heating pad allows you to ease and treat pain. Thermophore Classic Heat Pack can ease your pain – it will relax your muscle and ease pain. 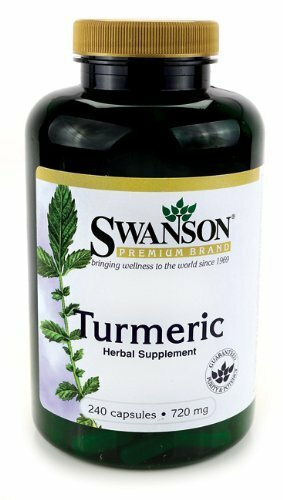 It helps with back pain, arthritis, rheumatic pain, joint pain, muscle spasm, TMJ. Its simple operation makes it possible to use this heating pad at home. Press the control lever and hold it down until it reaches your desired temperature. When you get the temperature that you want, release the switch. Repress the lever when the pad cools down. 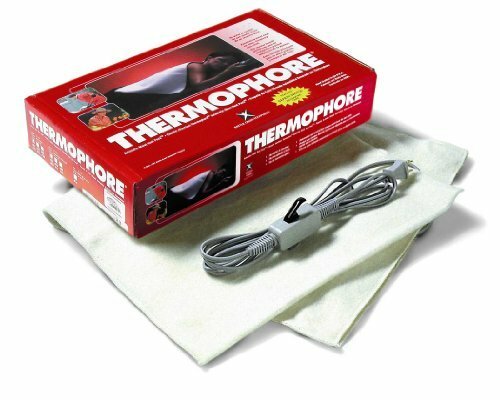 This classic heating pad by Thermophore is a good choice for people who have been familiar with the brand product. It is a good moist heat therapy pad. It can cover a large area of the body and heat it up quickly up to 180oF in seconds. The air moisture draw function is also convenient. However, it ranks last in my least for some reasons. It offers no dry heat, no auto-off function, and no specific heat setting. Besides, the bad is really heavy that I do not feel comfortable to place on my body. It is also pricy to me. Check out the below comparison table of the above 5 best heating pad for back pain and decide which one can help you fight your back pain and body pain best. This is a quite long article but I believe it have provided you with some helpful information to choose the best heating pad for back pain. 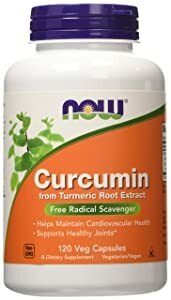 All of the products in this article can ease and treat not only back pain but pain in various body parts or just to relax your body. Make sure you read the article carefully and choose the most suitable heating pad for you. And please remember that a heating pad or any other treatments can’t ensure 100% success if you don’t maintain a healthy lifestyle. You can combine a healthy diet and exercise plan to maximize the efficiency of heating pad treatment. I will be more than happy to know that my article has helped you to defeat your back pain. Thank you for reading.